Last week I did the unthinkable and put down a book I’d only half finished. Put it down, I say, with no intention of picking it back up again — a sign of readerly metamorphosis if there was one. Get Kafka on the phone pronto. 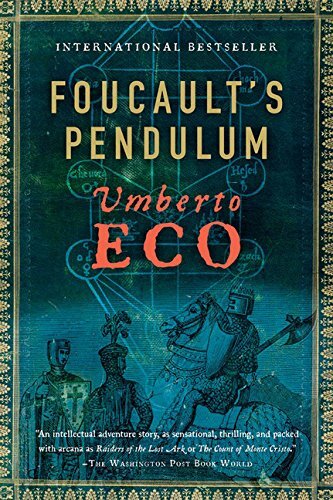 Foucault’s Pendulum is the book I could not bring myself to finish, and while I do regret having to shelve it, I’m happy to be rid of the thing. Eco’s writing is terrific, but he’s a smothersome storyteller with a fetish for excruciating detail — a tolerable idolatry so long as the story is going, you know, somewhere. Forty-five chapters and three hundred pages in, the pendulum had hardly budged, and all the Templars and conspiracy theories in the world can’t save you then. A few months ago, dropping any book halfway through would have been unconscionable, so what gives. Between work, planning, and other writing commitments, my reading time now is significantly less than it used to be. (This isn’t a complaint, just a bald fact.) I’m more jealous of that time as a result: less forgiving of books that seem to be wasting it, and unwilling to invest energy into that which is not enjoyable, or enlightening, or at the very least, interesting. Three strikes, and Foucault’s Pendulum was thrown out on its ear. It’s not that I don’t like a good challenge. It’s not that my tastes beg for blazing guns, mad scientists, and rubber-melting car chases. When I read a story, however, I do expect to enjoy myself. Enjoyment isn’t everything, but it is something, particularly where a novel is concerned. You know that feeling you get when you’re stranded in the middle of the ocean in a crappy inflatable with no rations left? No? Well, try to imagine it. No land in sight, no breeze, and a whole lotta sun. You start to go mad. You see things. You sink your teeth into a juicy chicken drumstick and then realize it’s your arm. You need to be rescued. Soon. Preferably before the sharks come or you dine on your own flesh. Can you picture it? Feel it? Good. That was me reading Foucault’s Pendulum. That was me trying to cope with the stodgy characters, the Byzantine plotlines, the seemingly everlasting descriptions of occult rituals. It all seems like super important stuff until you realize that what you mistook for intellectual sophistication is really just an elegant, overindulgent mind-fart.